The Best West La Corona is located at 1166 M.H. del Pilar corner Arquiza Street, Ermita, Manila 1000, Philippines. The telephone number is + 632 524-2631. It is 8.2 kilometers from Ninoy Aquino International Airport. If you are traveling by taxi, you are best to tell the driver it’s close to the American Embassy as a GPS is seldom used in the Philippines, and there’s a 90% chance he won’t know where it is. As I say in most blogs, make sure the driver uses the meter. As always, beware of “great deals” offered without the meter. As with most of Manila, the area surrounding the hotel seems somewhat slummy. If you go outside the hotel and turn left and walk for a block or two, there’s a 7/11 and a Mini Stop. If you turn left at these landmarks, and walk a few more blocks, there is a large Robinson’s Department Store where you can find and eat just about anything you want. You will have to fight your way through a vast array of traffic, however. The city is notorious for lack of pedestrian crossings. The area is safe during the day; although, I wouldn’t venture very far at night. As with any city, play it safe and don’t display anything that appears expensive. The hotel entrance is nice, and there will be a doorman there to open the door and greet you with a smile. The receptionist is always pleasant. The process of checking in, however, is usually brutally slow. I got there around 3:30 and was told they had to prepare the room and ended up waiting about 20 minutes. I’ve read about this in other blogs, so I was prepared for it. Nevertheless, they do offer you a cup of coffee or a glass of juice while you wait. In general, the reception area is well laid out and furnished with appropriate chairs and chesterfields. There is only one elevator, but it seems to service the hotel well. I’ve traveled Asia enough to know that bathtubs are not common in hotel rooms. One of the main reasons I chose this hotel was because I saw a reflection of a bathtub in the mirror of one of the pictures. I do, however, believe in the saying “buyer beware.” In light of this, I asked if the deluxe room I booked had a tub. I wasn’t all that surprised when the answer was “no.” I told the receptionist that a bathtub was one of the reasons I chose this hotel and I wasn’t very happy. She very quickly and professionally upgraded my to a suite free of charge, which really impressed me. The hallways of the hotel wer clean but somewhat dingy and poorly decorated. The room itself was huge. 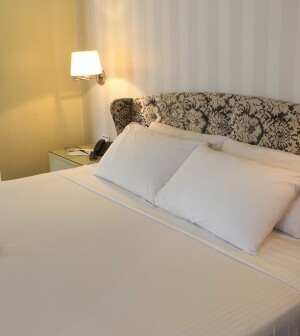 It had a king size bed made up to hotel standards, nice linen, a comfortable mattress, and fluffy pillows. It had a bank of 6 or 7 beautiful windows that eloquently curved around the corner of the room. On the one side of the windows, there was a door that led out onto a small balcony. The railing, however, was only about three feet high, and being on the 6th floor made things a little bit scary. There was a flat screen television with a good selection of English channels and a bar fridge with a selection of beer and soda at a premium price. I bought snacks outside of the hotel and had to take everything out of the fridge to put my stuff in. The room was nicely decorated and extremely clean; although, the chairs and the fabric on the head of the bed were faded and looked as if they came out of the Victorian era. The hotel provides standard amenities such as bottled water, tooth brushes, soap, etc. Room service and in room massages are available at a reasonable rate. Most bookings come with a free breakfast which is served from 6:30 to 10:30. The first morning, I went down at 6:30 and the food was decent. It was buffet style containing toast, scrambled eggs, sausages, braised pork, fried rice, etc. The decor of the dining room was nice. When I sat down, a waitress quickly offered me coffee and juice. Although the breakfast was satisfactory the first morning, the second morning was a totally different experience. I went down at 9:30 and found some watery, limp slop that appeared to be scrambled eggs. The rest of the food was cold and looked like it had been in the steam trays for quite some time. I asked a waitress why the food was such poor quality, and she told me it was because of the time. As you may have guessed, my little rant didn’t stop there. I had a chat with the manager and told him that I should get the same quality of food at 9:30 as I would get at 6:30. He agreed with a smile, and I was offered a freshly cooked breakfast. This redeeming factor, once again, impressed me. In general the staff at this Best Western are superb. They are accommodating, friendly, and professional. Most importantly, they always greet you with a genuine smile. I stayed at the Best Western Hotel La Corona again a couple of months later. Actually, the general manager emailed me thanking me for writing the review and suggesting ways they could improve. She wrote that if I would like to stay at the hotel again, she would be more than willing to make reservations for me. I had an upcoming appointment in Manila, so I gave her the date, and she made a reservation for me. She asked me to email her back and let her know what time I would be arriving. All of the shortcoming I had mentioned in the previous review had swiftly disappeared. Checking in was swift. While we waited a short period of time, we were ushered into the dining room and offered coffee, juice, and pasties. The bellhop showed us to our room with a glowing smile, turned on the TV and air conditioner. The room was gorgeous, clean, and modern. It had a king size bed made up to hotel standards. Eloquently decorated with mirrors behind the bed, the room looked twice as large as it really was. All of the furniture was modern, new, and clean. The bathroom, equipped with a large jacuzzi, beautiful shower and toilet stalls, was huge and spotless. We went down for breakfast at 9:30 and the food was fresh and delicious. Of course, the staff greeted us with warm smiles and brought us coffee. Since my last visit, they introduced an egg station where a staff member cooked fried eggs or an omelette. There were also a number of fresh vegetable you could choose to have put in your omelette. The food and staff in the restaurant were incredible. I take my hat off to the staff at the Best Western La Corona for designing and implementing the new changes. This is clearly a staff, under great management, that can introduce and execute changes expeditiously while maintaining all of its traditional standards of excellence. In my experiences with dozens of hotels around the world, this is by far one of the best hotels I have ever stayed in. Keep up the great work.